Out of the trash and on to your wall. 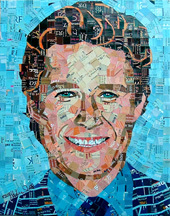 Popular "Junk Mail Mosaic" artist crosses the country and keeps on cutting up junk mail to create amazing portraits. 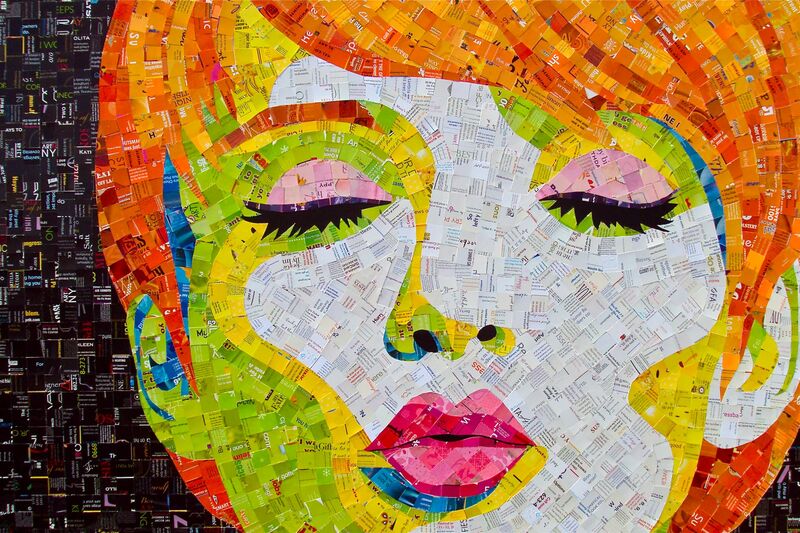 Junk Mail Mosaic Artist Sandhi Schimmel Gold http://www.schimmelart.com, one of pioneers of the eco-friendly fine art movement has recycled her old location by moving to the east coast. 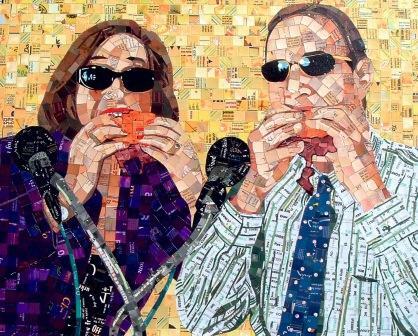 The artist is now residing just outside Richmond, VA.
Schimmel Gold, an avid recycler, was the first artist to upcycle junk mail - by cutting it into individual "tiles" to create amazing mosaic portraits. 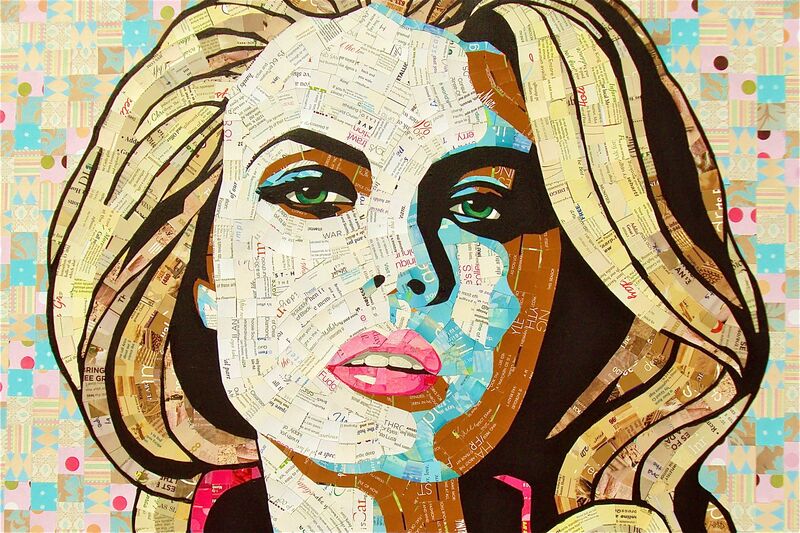 Taking inspiration from George Braque's Papier Collé [paper pasted on to canvas] and her own painting style, [often compared to Andy Warhol], Schimmel Gold combines her love of mosaic, portraiture and ecology into one definitive art style - Junk Mail Mosaics. Schimmel Gold's work is aggressively collected. She has work in private and corporate collections in the U.S., Mexico, Asia and Europe. In addition, she has had several solo museum shows, and has work in the permanent collections of museums in the U.S. and Europe. Schimmel Gold has also created comissioned portraits for many celebrities, including: Nancy O'Dell [Entertainment Tonight], Billy Bush [Access Hollywood], Holly Robinson Peete [The Talk, Celebrity Apprentice], Eva Jeanbart-Lorenzotti [Project Accessory], and models Linda Evangelista, Kate Moss and Coco Rocha. A very limited number of these extraordinary custom portraits can be commissioned each year. To show this artists work, commission a portrait or schedule an interview please contact the artist via email: artist(at)schimmelart(dot)com. To view current work "in person," visit these galleries: RawStyle Gallery in Santa Monica - CA, The Loft at Liz's in Los Angeles - CA, Translations Gallery in Denver - CO, Arts & Artisans in Chicago - IL, Matthew Campbell Gallery in Greenville - SC. Limited Edition prints are available at Eco-Centricity in Phoenix - AZ or visit the artist's studio/showroom at Artworks in Richmond, VA.